Westchester’s finest Indian restaurants feature some of the outstanding authentic regional Indian Cuisine served in an elegant surrounding. Our restaurant has been hailed by the 2008 Zagat Survey as the "Top Choice for Indian Food" in Westchester and has also been voted as the excellent Indian Restaurant from 2009and 2012.Also in the past years many food critics has praised and reviewed us an excellent Indian restaurant. 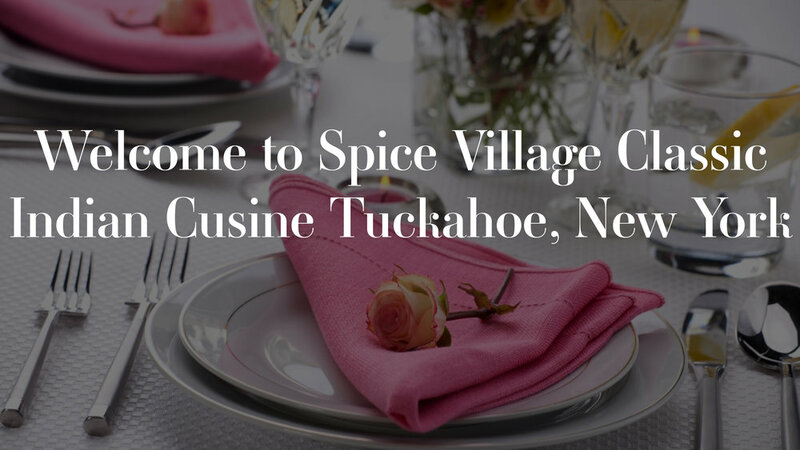 We invite you to experience not only the best of Indian cuisine but also a taste of rich Indian culture at Spice Village. "Went here for the weekend buffet and as usual was not disappointed. The food was delicious! Good variety of different curries, rice, breads, and appetizers. Desserts were also available via the buffet. The waiters were friendly and very prompt to refill water and remove any unwanted dishes. The price was very reasonable for under $30.00 for two people. We were very satisfied with the food and the flavors are very authentic. " "My family has gone to this restaurant on multiple occasions for the lunch buffet and each time we have left happy and full customers. The food is delicious and fresh. The buffet offers a great variety of Indian dishes including multiple desserts. The masala dosa is available with the buffet but you have to ask for it as it is made to order. The bar also carries a variety of Indian beers and wine! Will definitely be returning!" "The food was really good. The seating was nice and quiet. Gets busy in the evening. Free wifi. Love the lamb chops. Parking was easy. Will come here again."